Many times I have heard people say “I’m searching for my purpose in life.” It is true that there is a vast difference in living a life with purpose vs. a life without purpose. But what I always tell people is, don’t find your life’s purpose, create it. Life really has no meaning unless you create meaning for yourself. Very few people actually write down their goals. Fewer still, print them out and frame them. Written goals are powerful for focusing the mind. When you write a goal down your subconscious brain begins to more actively think about bringing it into your life. When you see your goals clearly, your mind can more naturally find and filter those opportunities that match your goals. Nearly anything is possible that you set your mind to and work hard at for 10 years. For that reason, I don’t waste my time writing down New Year’s Resolutions. But I do have a long history of sitting down and writing my goals and posting them where I can see them all year. And I have a long history of creating vision boards packed with photos and phrases that give me something to sink my teeth into. At the end of the year, I review it. Ryan Allis has a famous 1,200+ page powerpoint presentation that quantitatively and systematically takes you through setting goals in all areas of your life. He says that if you have hit more than 66% of your goals then they were not ambitious enough. I’m not sure if I agree with that, but I can say from experience that visualization and setting goals works. And the 10-year rule is remarkably true. 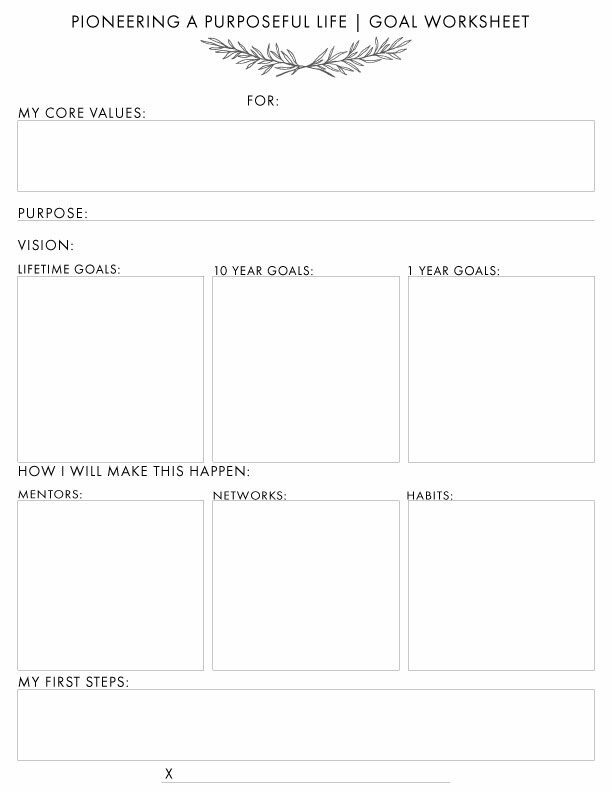 So with that in mind we’ve created a printable worksheet for you to fill out and frame and set over your desk, your bathroom mirror or anywhere else you’ll see it. Print out multiple copies and hang them in multiple places if you can! And take a picture of it and share it with us on social media so we can inspire each other with our goal of living and creating a purpose-driven life. 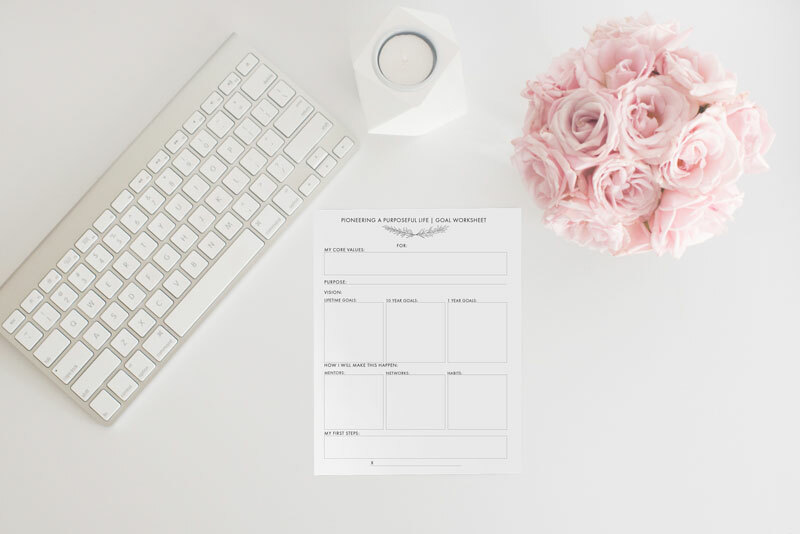 At the top of the worksheet, you will see a header “For” this is because we encourage you to fill out this worksheet for each major area of your life: Love, Money, Health, and so on. To Pioneer a Purposeful Life we all must first begin by defining our core values. These will ultimately lead you to your purpose. What is most important to you personally? What principles do you hold in high regard? These questions are meant to help you find the greater purpose that drives your life and career. While they are not always applicable to each sub-area of life it is always important to note the greater purpose in each area so that you can achieve your overall vision. Your purpose is something you create it is not something you find. Life experiences and lessons can certainly influence it, however, you must have the intent to create for yourself. Vision. This is how you see your purpose in action in your life. The best way to see your vision at work is to set goals with your purpose in mind. We break our goals into 3 sections for this exercise. You can also break your goals down further into short-term goals once you have your bigger ones defined. Begin where you like, some people like to start big with the “Lifetime Goals” and then break down, while others like to build up. Get specific with your goals. Broad generalizations are hard to measure and often times don’t yield successful results. Force yourself to dig and get specific. We like to set about 5 to 8 clearly defined goals for ourselves. It is important to ask yourself when setting goals what success and completion of this goal look like. How will you measure it? Keep this in mind when setting your goals. Goals without purpose or plans are merely meaningless wishful statements. To really pioneer a purposeful life you must get resourceful. We all have an abundance of untapped resources around us, whatever the situation, we just have to acknowledge and make use of them. Mentors are people you look up to who have a similar purpose as yours. You should have a mix of mentors in your life, meaning ones you can call on the phone and even people whom you’ve never met, but have great success in which you would like to emulate. It is a good practice to define who your mentors are so that you can look at what they are doing to achieve success with purpose. Though, it is not one-size-fits-all, learning from people is key to achieving a purposeful life. Write them down so you can remind yourself to reach for them when on the course of achieving your goals. Networks or groups of people with similar interests as you, are vital in pioneering a purposeful life. Life has taught us many times that it is far more difficult to get somewhere alone. Who in your community should you be seeking support and inspiration from? Is there a group you’ve been wanting to join, but keep finding an excuse not to? With your purpose in mind define what networks will best support your goals and cultivate inspiration. It is also important to have people to hold you accountable. The power of habit can be your greatest strength, but also detrimental if you don’t cultivate positive ones. What habits will propel you forward towards your goals? Define these, get specific with them. Look at them every day so that you can keep them at the forefront of your mind. At the bottom of your worksheet, you’ll see an “x,” this is where you are to sign and date it. It is a contract you are making with yourself. You may make adjustments as the year goes on but it is important to always hold yourself accountable and keep your purpose as your driving factor behind all of your actions. 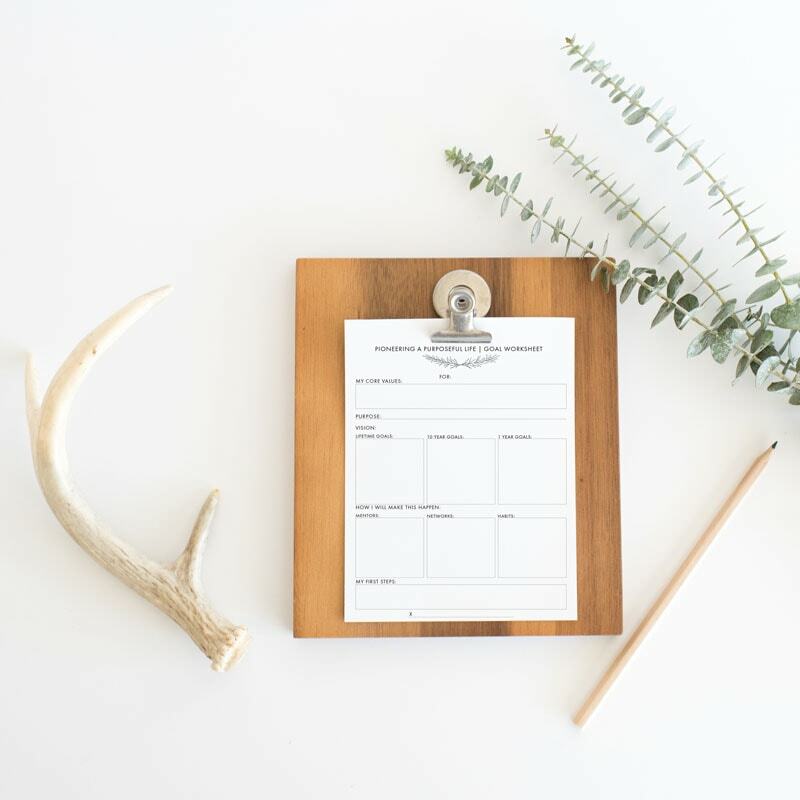 We want to see how you use this worksheet. Snap a photo and tag us on social media. Want more printables? You can find them HERE.